COUNCIL BLUFFS-The Pottawattamie County GOP met on a rainy Friday evening for their 2017 Annual Lincoln / Reagan Dinner. The high profile audience included US Senator Tom Cotton, Lt. Gov Kim Reynolds, Secretary of State Paul Pate, State Auditor Mary Mosiman and Cedar Rapids Mayor Ron Corbett along with local members of the State Legislature. One missing lawmaker, Representative Greg Forristall who passed away recently was repeatedly mentioned for the impact he made on the state and his local community. Many speakers offered their condolences. County Recorder, Mark Brandenburg, gave a touching tribute to the late lawmaker. It’s not easy to sum up a man’s life in a few paragraphs, especially when that man in Greg Forristall. Greg was an adventurer, a traveler, a farmer, a gourmet cook, a woodworker, a public servant, a lifelong learner, and a man dedicated to others. He had one of the rare, truly Renaissance minds, as a scholar of science, technology, literature, language, and music. While he was on a constant quest to enrich his mind, he also had a lighter side. Greg was a devoted Hawkeye fan, loved science fiction (especially Star Trek), put on fireworks displays that made every adult feel like a kid again, and he was a late-night internet shopper. Carol was never surprised to have anything delivered to her door-and I do mean anything: a flying drone, rare coins, antique cuff links, boxes of books, dogwood bushes, and even undershorts in bulk. In debate with him, on the Iowa House floor, found themselves engaged in a battle of the minds. When the Iowa House was voting in the collective bargaining bill, which was of great importance to the Governor, and he needed his vote, Greg excused himself from the hospital and arrived during the final voting process to cast his vote. The last time he was on the Iowa House floor, he ran an important education bill on home rule, and as usual, destroyed the opponent’s arguments in his closing statement. “Greg was a happy warrior.-after hearing from his constituents, he’d plant his feet and stand firm for what was best for them and their families. My fond memories and my respect for Representative Forristall, will never diminish. When introducing Lt. Gov Reynolds, Master of ceremony, Chip Maxwell, mentioned that it could very well be the last time she was introduced with the title Lieutenant Governor. 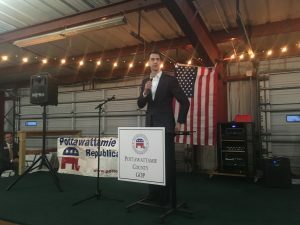 US Senator Tom Cotton from Arkansas who was the keynote speaker joked about the upcoming vote to make Branstad Ambassador to China that will next week will make Reynolds Governor. Lt. Gov Reynolds recounted coming into the motor vehicle section of the Clarke County Treasurer’s office from the private sector. “I had so many ideas on how to make the office better. I thought we could use more automation and processes that could make the office run more efficiently. Every night I would come home and talk about it to Kevin. After four years the Treasurer decided not to run again which is practically unheard of in county offices. Nobody in the office wanted to run. I asked Kevin about it and he said that if I didn’t take the opportunity to implement all the ideas I’d been sharing with him for the past four years he didn’t want to hear about it again. Senator Cotton talked about the state of the Democratic Party and said “they just aren’t getting it.” He mentioned that Chuck Shumer had protesters outside of his house because he’s not liberal enough. He discussed the recent Mayoral race in Omaha where Bernie Sanders endorsement of the Democratic candidate was rebuked by progressives because the candidate was not pro-choice enough. Cotton discussed his military service, graduating from Harvard a lawyer but enlisting as an infantry paratrooper because he was inspired by the attack on 9/11. He mentioned the eroding American Dream which he said Democrats are trying to pass off as “The New Normal.” He juxtaposed the phrase several times with the phrase “Time for a New Beginning” in what could potentially become a slogan for a distant presidential bid from the young Senator. He said he wanted to wait a few weeks for Governor Reynolds to get settled before he made an announcement which he expected to do late in June.